Every day there are hours of airtime on CNBC and Fox Business filled with commentary on what is going on with the stock market. Why did it just go up, or Why is it poised to go down? Add to that the thousands of articles and post positing the same thing, and it’s a lot. It makes you wonder if there are really that many intelligent things to say, or are they just filling time. 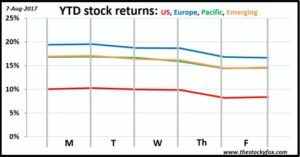 Every Friday I am going to do a quick post looking at the week for stocks and trying to distill what the really important stories were that drove the market. 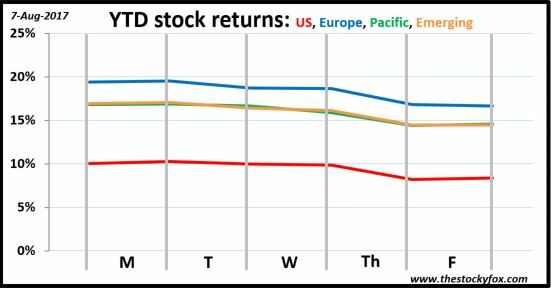 For this week stocks were pretty much completely flat through Wednesday. Then North Korea and some earnings misses hit on Thursday and Friday, knocking the US markets down about 1.5% and international markets down about 2.5%. Here is my take on what caused it all. You know it’s a slow week for business news when the top story is a memo regarding gender diversity from a Google employee. It’s not that the story isn’t important—it is. However, it seems like more of a social issue than a financial markets issue. This wasn’t a story about how Google is growing it’s sales or earnings or how it is going to expand into new, profitable markets. Those are the things that typically drive stocks. This seems more like the type of story that leads the “News” section on mainstream news outlets like The New York Times and CBS Evening News. It did that for sure, but it also got top billing on Yahoo! Finance and The Wall Street Journal and CNBC. Early in the week when the story was hottest, the market didn’t move a lot. It was a story on a very important issue (gender equality) in one of the most dynamic industries (tech) at one of Wall Street’s darlings. That made it an important news story, but it didn’t really reflect anything driving the financial markets. This was the dominant story for the week. Tensions have been high with North Korea for a while as it pursues a nuclear ICBM. Wednesday after the markets closed President Trump and North Korea’s Kim Jong-un started a war of words that put the world a bit more on edge. Trump said North Korea would face the US’s “fire and fury.” Kim said they were targeting their missles at Guam. Trump said the US was “locked and loaded”. That’s where we end now. Stocks fell sharply on Thursday as the market digested this. I don’t think most believe a nuclear war is likely (if it was, stocks would have fallen much, much more). But this does open the door to some ugly possibilities, namely would a war between the US and North Korea ultimately lead to a war between the US and China. Remember, in World War I millions of Germans and French killed each other after a Serbian rebel killed an Austrian prince. Snap is one of the new social media companies that has become a Wall Street darling. They don’t make money but there are (were) worth over $15 billion. I have never used Snapchat and can’t say I fully understand how it works. But I know my neighbor’s 13-year-old uses it and says that what all his friends are doing. Those crazy kids. Thursday night they released earnings and subscriber numbers that badly missed expectations and their stock cratered about 13% early Friday. This is actually good news because it shows the market isn’t getting caught in “new economy” euphoria, but evaluating these companies on fundamentals like sales, earnings, and growth prospects. It reminds me a bit of the internet bubble, but it seems we’re being a bit more rational this time around. Obviously this stock weighed the markets down a very small bit. But the silver lining is that it shows that all these new companies aren’t going to make it, but that some will be strong and emerge as titans (Facebook). Traditional brick and mortal retailers like Macy’s and Kohl’s reported earnings, showing that their sales are continuing to fall, but at a less rapid pace. That’s a bit of a backhanded compliment—things are still bad but they aren’t as colossally bad as they’ve been. We’re experiencing a generational shift in how consumers buy things. Stocks like Macy’s and Kohl’s and other retailers are getting hammered, but all that business isn’t just evaporating. It’s shifting to other companies like Amazon who are giving consumers those same goods just in a different way. For the overall economy that’s a good thing, a great thing. There will be winners (Amazon) and losers (Macy’s) but overall we’ll end up ahead, and that’s good for the stock market. Nice recap. Thanks for the insights, and keep it up! Interestingly, we have friends and other contacts in S. Korea and they don’t seem nearly as anxious or worried as folks in the US about the dangers posed by their neighbors up north. I think decades of noise and saber-rattling, including ridiculous statements by N. Korea’s leaders, regular missile tests (including a high % of failed ones), and their many acceptances of hand-outs and aid, have caused S. Koreans to become somewhat de-sensitized to all this stuff. Still, it’ll be fascinating to see how this all plays out. Finally, the N. Korean buffoon of a leader (Kim Jong-un) has met his match in Trump who has no reservations about, and seems to relish in, making threats against the small, isolated country.